On April 14, 2012, it was announced that Leyritz is returning to the Yankees on a personal services contract! Jim Joseph Leyritz (The King) is a former catcher and infielder in Major League Baseball (MLB). In his MLB career, Leyritz played for theNew York Yankees, Anaheim Angels, Texas Rangers, Boston Red Sox, San Diego Padres, and Los Angeles Dodgers. 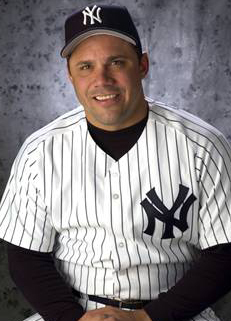 With the Yankees, Leyritz was a member of the 1996 and1999 World Series champions. After playing the 1985 season for the Kentucky Wildcats, Leyritz went undrafted by Major League Baseball, but was signed as a free agent by the New York Yankees. Leyritz made his MLB debut for the Yankees on June 8, 1990. He is best known for his 3-run home run off Atlanta Braves closer Mark Wohlers in Game 4 of the 1996 World Series. That home run was significant, as the momentum from then on shifted towards the Yankees. After the 1996 season, the Yankees traded Leyritz to the Anaheim Angels for two players to be named later (PTNBL): minor leaguers Jeremy Blevins and Ryan Kane. On July 29, 1997, the Angels traded Leyritz and a PTNBL (minor leaguer Rob Sasser) to the Texas Rangers for Ken Hill. After the season, the Rangers traded Leyritz to the Boston Red Sox with Damon Buford for Mark Brandenburg, Bill Haselman and Aaron Sele. On June 20, 1998, the Red Sox traded Leyritz with Ethan Faggett to the San Diego Padres for Carlos Reyes, Mandy Romero and Dario Veras. With the Padres, Leyritz appeared in the 1998 World Series against the Yankees. On July 31, 1999, the Padres traded Leyritz to the Yankees for Geraldo Padua. On June 20, 2000, the Yankees traded Leyritz to the Los Angeles Dodgers for Jose Vizcaino and cash. Leyritz served as a pinch-hitter more extensively toward the end of his career. He batted and threw right-handed exclusively in the majors, but was known to switch-hit in the minor leagues. Leyritz is also known for hitting the last home run of the 1990s, in Game 4 of the 1999 World Series.